PENAMPANG: Though their village remains inaccessible by road, 400 villages of Kampung Buayan on the Crocker Range here are enjoying round-the-clock power supply. The electricity is not only free but is produced in a pollution-free way by harnessing the power of a nearby river. This mini-hydro system was launched by Penampang MP and Minister in the Prime Minister’s Department, Tan Sri Bernard Dompok, on Monday. Having power supply means so many things to so many people here. “Schoolgoing children are now able to study at night and use a computer at home,” said Robert Gubal, 33, headmaster of the village’s only primary school which has 53 pupils. Kampung Buayan chief John Sabating, 45, said the system was capable of generating up to 10 megawatts of electricity. The villagers no longer needed to rely on kerosene lamps and small generators that used expensive petrol, he said. 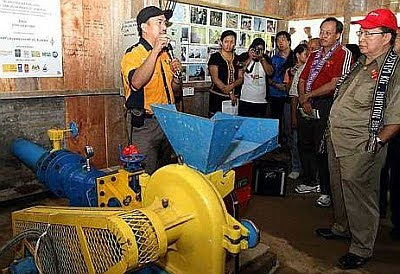 “The system also means there is no longer a need to carry fuel from Donggongon town, which required a three-hour walk and a hour’s ride on a four wheel drive,” he added. The villagers built the system with help from Raleigh International volunteers and technical support from local NGOs namely Partners in Community Organisation, Tonibung and Jaringan Orang Asal seMalaysia. 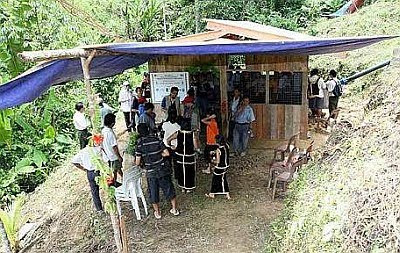 Danish International Development Agency (Danida) contributed RM250,000 for the system that cost RM450,000. Another RM100,000 was contributed by Dompok and Moyog state assemblyman Donald Mojuntin. Pacos Trust president Dr Felix Tongkul said the Kampung Buayan mini-hydro system was the fifth to be supported by Pacos, with the earlier ones being built in Long Lawen, Belaga and Bario Asal in Sarawak and Kampung Terian and Kampung Bantul in Sabah. The system produces electricity via a small turbine with an electronic load controller for stability and safety. The project included enrichment planting and mapping to ensure sustainability of the water resource that ran the system. Dr Felix said the system incorporated a rice mill and an irrigation system as well.